Botrytis can be seen sporulating on this Petunia flower. Cause Botrytis cinerea, a fungus that colonizes senescent, dead, dying, and wounded plant parts. From these infections they can attack healthy tissues. A moist, humid environment is ideal for pathogen sporulation and spread. Conidia may come from sources in and outside the greenhouse. It is found everywhere plants are grown and has a wide host range. Flower petals are most susceptible at any stage of development. The disease can also be a secondary problem to ethylene during transport to markets, called petunia meltdown, especially under warm, wet, low light conditions. Symptoms Senescent flowers develop small translucent or necrotic spots. A leaf blight may occur when infected floral tissue lands on the foliage. Water-soaked lesions may form on the stem and if severe, the shoot will die. Infected stems become tan to light brown and may display the fuzzy olive-brown or gray fungal sporulation. Remove all dead and dying plant parts (particularly blossoms) on and around plants. Make sure tight fitting lids are on all garbage cans used to collect plant refuse. Maintain a relatively dry greenhouse environment by keeping humidity below 85%, increasing spacing between plants for good air circulation, and taking care not to splash water on foliage during watering. Heating the greenhouse at night or venting around sunset may be necessary. Place fans in greenhouse to better circulate air. Covering greenhouses with long-wave, infared-absorbing plastic film may help by reducing greenhouse cooling at night. Other coverings that increase the blue:UV ratio can inhibit sporulation of some Botrytis isolates but is highly variable between crops and isolates of the fungus. The use of ethylene blockers (such as EthylBloc) before shipping have been helpful to prevent petunia melt-down. The use of calcium chloride has been helpful to prevent petunia meltdown. Chemical control Best when used with cultural controls. To minimize the development of resistant fungi, alternate, or tank-mix fungicides from different groups that have different modes of action. Limit the use of any one group during crop production. Isolates resistant to multiple modes of action have been found in some greenhouse situations. Exotherm Termil at 1 can/1500 sq ft of greenhouse. It ignites to form a vapor that condenses back on the plants. Do not use during bloom. Group M5 fungicide. See label for details. 24-hr reentry with no ventilation or 12-hr reentry with ventilation. Medallion WDG at 2 to 4 oz/100 gal water. Using with oils or adjuvants may damage plant. Group 12 fungicide. 12-hr reentry. Mozart TR at 1 can/4,500 sq ft of greenhouse. Group 12 fungicide. 12-hr reentry with no ventilation. Orkestra at 8 fl oz/100 gal water. May discolor flowers if sprayed directly. Group 7 + 11 fungicide. 12-hr reentry. Phyton 27 at 1.3 to 2 oz/10 gal water. Group M1 fungicide. 48-hr reentry. Terraguard SC at 4 to 8 fl oz/100 gal water. Group 3 fungicide. 12-hr reentry. Although not specifically registered for petunia, iprodione (Chipco 26019) is legal for use on this crop. According to IR-4 data it is safe to use. Other trials in California indicate that there may be some problems using these materials on some cultivars where multiple applications resulted in severe interveinal whitening. This product provides good control of Botrytis on many other crops. Reference Gould, A.B., Kobayshi, D.Y. and Bergen, M.S. 1996. Identification of bacteria for biological control of Botrytis cinerea on petunia using a petal disk assay. Plant Disease 80:1029-1033. Samarakoon, U.C., Schnabel, G., Faust, J.E., Bennett, K., Jent, J., Hu, M.J., Basnagala, S., and Williamson, M. 2017. 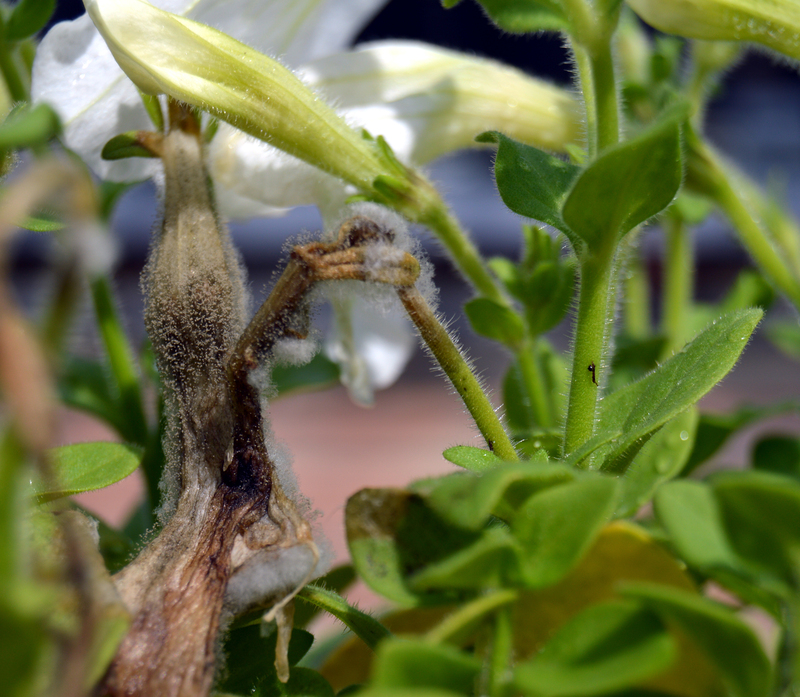 First Report of Resistance to Multiple Chemical Classes of Fungicides in Botrytis cinerea, the Causal Agent of Gray Mold From Greenhouse-Grown Petunia in Florida. Plant Disease 101:1052.